In Claude Shannon’s model of communication, “equivocation” refers to the average uncertainty in the message delivered when the message sent is known. After the meaningful message is subtracted from the signal, the residual uncertainty must be due to the noise of the channel. If we are to estimate the fidelity and capacity of the media through which a message is communicated, noise must be present. 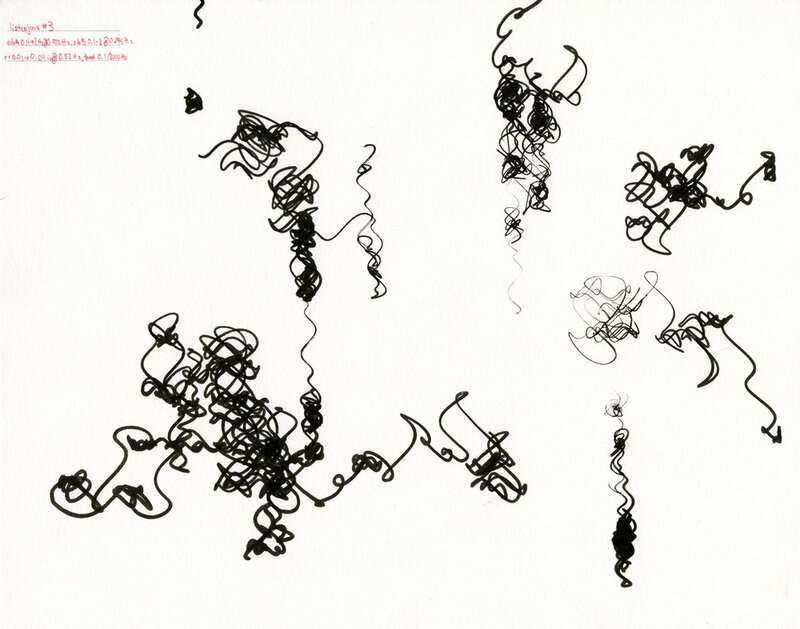 This series of drawings on paper explores equivocation using a digital pen plotter. The plotter is capable of rendering very precise images on predetermined paths, with choice of surface and implement introducing the most noise in the final result. In these experiments, however, the plotter’s motors are programmed in real time, leveraging the machine’s unequivocal precision to expose the noise present in the transmission of data to digital movement. 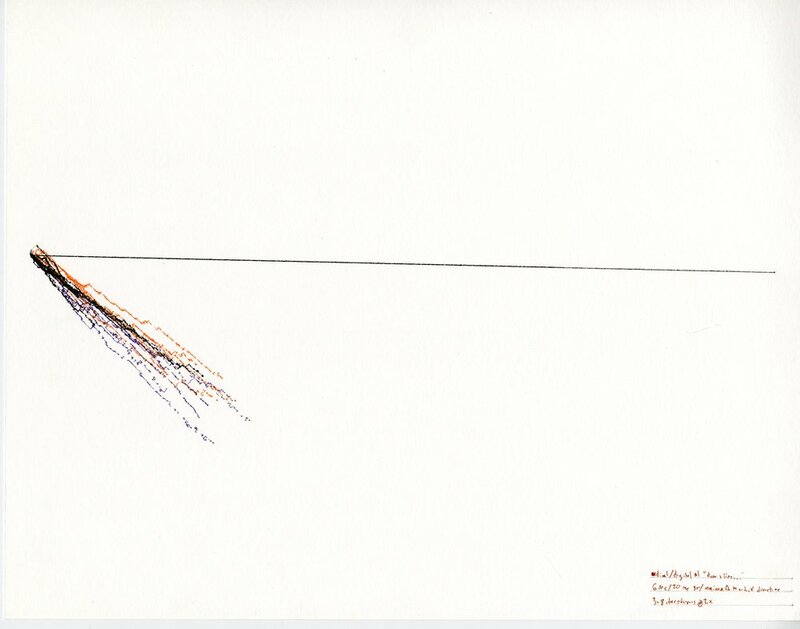 The drawings are spatial documents of temporal processes, while the sound magnifies the physicality of the machine’s maneuvers in the installation space. In some experiments, a simple process is continuously executed without regard for the plotter’s limitations, the pen sometimes moving erratically as the motors struggle to comply with the impossible speeds dictated by the algorithm. In others, the drawing board’s vibrations are captured with piezo microphones and its motors’ electromagnetic fields with telephone taps, attempting to convert these audio signals to position data and back again in iterative cycles. The circuit between “virtual” and “actual” is complicated by feedback – not to achieve equilibrium, but to materialize uncertainty in the translation between different machine epistemologies. Systems break as their constituent parts exceed the system’s capabilities to support them. Often these breaks cause violent and sudden shifts rather than gradually increasing chaos. The machine draws shapes of expanding diameter. Suddenly, the movements become too large for the motors to complete in the given interval. The marks become increasingly erratic and sparse, and eventually the motors are completely paralyzed with impossible instructions. The plotter is driven by a single belt looped around two motors, which must work in coordination to move the pen in two dimensions. For example, to make a horizontal straight line, they move at the same speed in the same direction, while a vertical line requires them to move in opposite directions. Curves require one motor to speed up while the other slows down, changing directions. In this experiment, the sound of each motor is picked up by an induction loop “telephone tap” and analyzed for its frequency content. The estimated frequency is fed into a sine or triangle wave oscillator. The two oscillators are plotted against each other as a lissajous curve (a graph useful for visualizing complex harmonic motion). As the sound of each motor is fed back to control its speed, the system approaches equilibrium, creating increasingly simple geometric shapes from the harmonically-related speed of the motors. Eventually the imperfect process of digital sampling and frequency analysis causes the pen to wander off course, starting the process over again elsewhere on the paper. By comparing the amplitudes of the piezo microphones under the four corners of the drawing surface, the approximate position of the pen on the drawing surface can be determined — theoretically, each microphone should give a higher reading as the pen scratches closer to it. However, because of the small surface, digital sampling error, and the rigid material which easily transmits vibrations to all microphones, the readings are very crude. These experiments start with a simple, predetermined shape, drawing it on the paper and recording amplitude information from each corner’s microphone. In the following iterations, the total original length is broken up into a series of small movements, each at 45-degree angles, toward or away from the corner that had the loudest sample at the corresponding moment of capture.